Alta, UT – Utah’s Alta Ski Area is currently studying the possibility of erecting a ski lift up Flagstaff Mountain on the north side of Little Cottonwood Road, across the street from the existing lift-served ski terrain. Utah’s Alta Ski Area this spring conducted an on-snow lift survey on Flagstaff Mountain to explore the possibility of using a ski lift to control avalanche risk above the town in Little Cottonwood Canyon. Earlier this spring Alta officials ordered a ski lift survey, an on-snow study that limits the impact to vegetation while snow cover remains on Flagstaff Mountain’s slopes. According to Alta Ski Area spokesperson Connie Marshall, the survey was conducted to explore future avalanche control alternatives in the face of diminishing supplies of artillery ammunition available from the U.S. Federal Government. A number of years ago the Utah Department of Transportation (UDOT) and Alta Ski Area cooperated on a study to explore avalanche control alternatives above Alta’s lodges and business on the south-facing slopes opposite the ski area in an effort to reduce or eliminate artillery usage. A ski lift ascending the ridgeline of which Flagstaff Mountain is a part was a recommended solution. The lift would allow snow safety teams access to control the avalanche risk via hand charges and other techniques generally employed in-bounds within the ski area. The current study is being conducted by Alta in conjunction with UDOT and neighboring Snowbird Ski & Summer Resort. It’s not yet clear if the skiing public would be allowed to utilize such a lift, if built, but the lift itself could draw the ire of the local backcountry skiing community that has already noticed the survey markers erected on Flagstaff’s slopes. Should Alta restrict uphill access as it does within the current ski area boundaries during the season, backcountry skiers would be deprived of a popular recreation area that they currently use extensively. 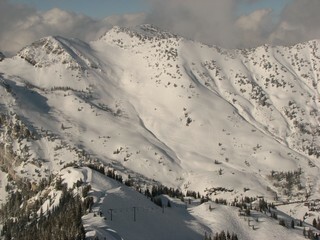 Should the public be allowed to ride the lift, and Alta maintains their current open-boundary policy, guests would also gain easy access to out-of-bounds areas descending from the Reed and Benson Ridge into Days Fork and Mill D South Fork that currently see little competition amongst backcountry skiers for fresh powder. On the other hand, if lift usage is restricted to snow safety personnel, backcountry enthusiasts could find enhanced avalanche control on some of their favorite terrain.